One great way to enjoy your landscape year-round is to install LED landscape lighting. There are so many beautiful natural fixtures you can use, exciting ways to install the lighting to highlight your landscape and lighting creates a safer outdoor environment. There are many types of lighting that you can install to create just the right look. Up Lighting - lights are installed at ground level and shine upward to highlight a specific focal point, great for accentuating the charm and character of your home, beautiful trees or sculptures. Down Lighting - lights are installed under an overhang to cast a shadow down, great for steps, under the counter tops of an outdoor kitchens or seat walls. Specialty Lighting - lights are placed around the patio or pool to add ambiance to your outdoor entertaining area. Here are some of the fun ideas for your home. Let us know how we can help. Accentuate the architecture of your home or garden. Navigate stairways and walkways more safely. Create a romantic ambiance in your entertaining areas. Highlight water features and pools. As the summer heats up, so do the requests for pools. The hot trend we are seeing now is water features incorporated into the pool design. Whether it is water cascading from a stone waterfall or an intricate grotto located behind the falls, the new trend for pools is to add the relaxing element of falling water. Customers are incorporating fountains that shoot bursts of water through the air, elaborate cascades that drop a sheet of water into the pool and intricate waterslides for the kids (and you too). You can create your own natural wonder of the world right in your own backyard. Here are a few photos of some of the natural water features we have incorporated into our customer's pools. Enjoy and stay cool this summer! Pool with Hot tub waterfall. Pool with stone wall and waterfalls. Great article in the Henrico Monthly magazine describing many of the new trends in landscaping. We were featured discussing some of the great projects we have been working on this summer. There are so many exciting new products and creative ideas for turning your yard into a backyard oasis! Call us if we can help. Enjoy. Beautiful Bluestone Outdoor Living Room with Kitchen and Fireplace! We just completed an exciting project - a beautiful outdoor living room complete with fireplace and kitchen! The challenge: the homeowners were looking for a functional outdoor living room that could be used in the winter and the summer for entertaining. The solution: build them an enclosed room outfitted with a kitchen, fireplace, television and surround sound! We started the outdoor structure with large columns and topped them with a beamed wooden roof. We added some fencing to create walls to enclose the back and sides of the room. We laid a beautiful bluestone patio, built a stone fireplace and completely outfitted the kitchen! The fireplace has a wood box below and a television box above, perfect for football in the fall! We decked out the stone kitchen with a big green egg grill, warming drawers, refrigerator, side burner, built a seating bar and topped it all with black granite. To finish the room we added a sound system and plenty of ceiling fans to keep it nice and cool. It turned out beautifully. A room they will enjoy for season to come! Tips for Preparing your Yard for Spring! As we are getting our first warm, summerlike days in Virginia, it is time to start thinking about preparing your yard for spring. After a cold, snowy winter your plants may be looking a bit drab and dreary. Here are a few useful tips to help get your yard ready to enjoy on those beautiful spring days. Winter Snow Damage - Take a survey of your trees and shrubs to see if they have snow damage, broken limbs or branches. If you have shrubs with broken limbs, remove them by making a clean cut just above the stem node or branch collar. Then fertilize the plants with a slow release fertilizer for a new flush of growth this spring. Aeration and Fertilization - Spring is the time to aerate and fertilize the lawn to keep it green all summer long. You want to use a slow release fertilizer with the lowest possible phosphorus level. In this region we have very phosphorus rich soil, adding more will just create dangerous run-off for our waterways. Remember to fertilize the plants and shrubs as well. You can use the same fertilizer for the entire yard. When you are mowing your yard this spring you want to keep your mower blade high, it helps keep the weeds from germinating and will keep the new grass from burning in the sun. Knock-Out Roses - If you haven't cut your roses back, it is time. Make sure there is no new growth, and then take them back to 12" to 18" tall. Don't be afraid to cut them back that much, they will grow bigger each year. Add your new Hardscaping for Summer - Fireplaces are the new outdoor trend. We have already installed three since the beginning of 2013. Install an outdoor fireplace now and use it for the rest of the spring. This is also the time to start thinking about installing a pool for summer. Believe it or not we are working on our fifth pool project of this year. With spring on its way, it is time to get new hardscaping installed so that it will be ready for the summer. Check out more of our blog posts for tips on swimming pools and outdoor fireplaces. As always please feel free to call us for any of your design, landscaping and hardscaping needs 804-622-7477 or visit us on the web at www.carvillelandscape.com. Come visit us at the Richmond Home & Garden show this weekend at the Richmond Raceway. We created a beautiful hardscape with outdoor kitchen and landscaping. Stop by to ask questions and learn how we can help you create your own outdoor escape! Perfect Time to Sit by the Outdoor Fireplace! After our first cold snap and snow in Richmond, all I want to do is sit by a roaring fire! We just finished a beautiful stone fireplace with bluestone patio in South Richmond. What a great place to cozy up on a cool winter's night. Start thinking about how to make your backyard a retreat. Call us we would love to help. The Beautiful Views from the Fire Pit! Location, location, location! Isn't that what people say. Well location is as important in landscaping as it is in real estate. You want to find the perfect place for a patio to optimize your views. We did just that at this customers house at the Chesapeake Bay. Check out the views from the Fire Pit! A perfect retreat on a crisp fall night. A beautiful paver patio, complete with seat walls, columns with lamps and stone fire pit in the center. Just waiting for the marshmallows! Enjoy! Visit us at the Home and Garden Show theis weekend! We are all set at the Home and Garden Show this weekend. Come by our booth to see a beautiful marble patio, seat walls, outdoor kitchen with bluestone counter and beautiful plants! We are in the first building right by the entrance to the rest of the show. You can't miss us, and don't want to! For more infomation on the Home and Garden show, check out the link. See you soon! Carville Landscape Co. at the Maymont Flower and Garden Show this weekend! Come visit us this weekend at the Maymont Flower and Garden show at the Richmond Convention Center. Check out the attached link for more information on the show. We have a booth in the garden display area, featuring a beautiful landscape, patio, outdoor kitchen and fire pit. The perfect place to warm up on this cold, winter weekend! The guys are hard at work up at Kings Dominion prepaing for the new season! We are installing retaining walls and laying pavers for walkways around the Eiffel tower. FYI: I got a sneak peak at the new dinosaur exhibit they are installing. It is very cool! The little ones will love it (and maybe some of the big ones too)! 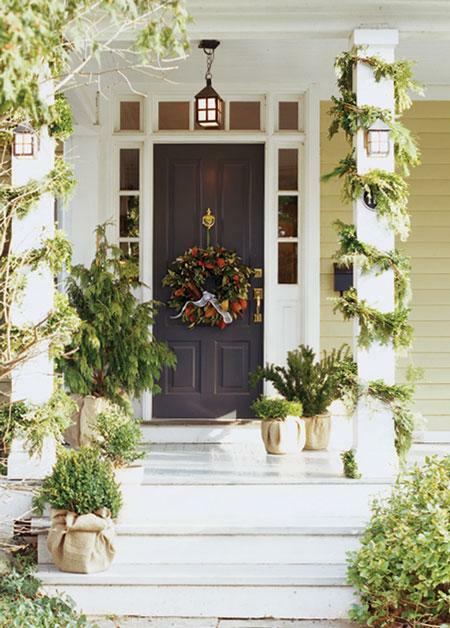 Bring the Outdoors in when you Deck the Halls this Year! It's time for holiday decorating, and the best way to deck your halls is to use fresh greenery from your garden! Every year my wife sends me out to the farm with my pruning shears, and I come back with fresh cuts of magnolia, evergreens, holly with berries and a little nandina for color. Then the decorating begins. Be creative, you can use the cuttings from anything; evergreens (this smells wonderful), magnolia, holly trees, pine cones, twigs, dried flowers and pods, anything with great textures from your garden. Just remember you are pruning the trees when you take cuttings, so make sure you are not leaving bare spots on your shrubs. Then take your bag full of fresh greenery and use them for garlands, wreaths, swags, fireplace mantel decorations, and for centerpieces or flower arrangements. You don't really need to have any flower arranging skills, just remember to try use cuttings with different textures and to make both sides look symmetrical. If you use a cutting on one side, put the same cutting on the other. Also incorporate candles, lights, ribbon and ornaments to add some additional holiday color and charm. Here are a few pictures ways to use greenery for holiday decorations from the web. Happy Holidays from your friends at Carville Landscape Co. Perfect Pool for a Small Space! If you have a really small backyard, you can still fulfill your dream of installing a pool. Take a look at our latest pool installation in a row house backyard. The project turned out beautifully and was a great use of the small space. We installed a rectangular pool with a lighted planting wall and three waterfalls. The pool deck is a three-piece concrete paver with pool coping to match. We also installed an outdoor kitchen and landscaping to complete the perfect backyard retreat. Enjoy! Beautiful shot of the pool and waterfalls. This is another view of the pool and shows how small the backyard really is. When you are starting a landscape project, large or small, you are thinking of one thing, how great it will be when it is done. All the new, exciting elements you will have at your home - a new patio, gourmet outdoor kitchen, pool for relaxing or beautiful plantings. You are not always thinking about the most important element of your project – hiring the right landscape contractor. Unfortunately in these times, everyone with a truck and shovel has become a landscaper. The cheapest price doesn't always mean you will receive the same quality and professional expertise. Here are some tips for items to think about when you choose the right landscape professionals to work at your home. Experience - When selecting a contractor, verify the landscape contractors experience before hiring them. If you are hiring someone to design your landscape, make sure they have a degree in landscape design or architecture and the experience your project requires. When comparing contractors, determine how long the company has been in business, check references, ask to see photos of completed work and even ask for a site visit to a similar project. Make sure you hire someone with the experience required for your project; you don’t want your contractor to learn how to do something for the first time at your house. Communication - One of the most important factors in selecting the right landscape contractor is communication. Make sure that your contractor communicates well with you and provides the service you expect. Look for professionals that return your phone calls promptly, keep appointments (and are on time) and most importantly make sure you both have the same understanding of your project. In some cases you may be working with this person for a few weeks or months, make sure you can be a good team. Licensed and Insured - Always make sure that any contractor that works at your home is licensed in your state and carries the proper insurances. Many large construction jobs require a contractors license. Without proper insurances, if someone is hurt on the job or a piece of machinery bumps your house, your homeowners insurance will have to cover the damages to your house and for their employees. Don't hesitate to ask to see a copy of liability insurance and you can check for proper contractor licensing at your states licensing office (in Virginia that is www.dpor.virginia.gov). Remember choosing the right landscape contractor can mean the difference between an exciting, hassle-free experience and a difficult, bitter disappointment. With a little homework you can have a safe and happy working relationship with your landscape contractor. Happy landscaping! It is Time for Football and Outdoor Fires! Here in Virginia we are getting our first real taste of fall - cool temperatures, football and outdoor fires! In honor of enjoying a nice cool, fall weekend by the fireplace, I thought I would share a few of my favorite fire features that we installed for customers. Below are a few blogs and photos that I think can help get you started in planning your outdoor fire feature. Give us a call if we can help. Outdoor Fireplaces - Some good tips if you are thinking about building a fireplace in your backyard. Outdoor Fire Pits - a good review of fire pits and the different types available. Stone outdoor fireplace with seating. Stone, half-circle fire pit overlooking the Chesapeake Bay. Stone outdoor fireplace with a side wood storage box. Circluar block fire pit with bluestone cap on a raised patio. The last few weeks have been nothing but hurricanes and non-stop rain. Now is a good time to assess all the damage the weather has done to your yard. Many of us have lost large trees or have newly formed ponds or drainage issues in our yards. With that in mind, I thought I would give a few quick tips on how to maximize the changes in your landscape. Trees - Unfortunately losing large trees can be a big blow to any landscape, but it can give you an opportunity to look at the space in a whole new way. You can always replant a tree in the old trees place; and fall is the best time to plant trees. Or take this time to use the space in an alternative way, like creating an entirely new entertaining area or burning the trees wood in a new outdoor fireplace or fire pit. And all the fallen sticks are perfect for roasting marshmallows! Drainage - All this rain has brought about new drainage problems. There may be a new pond in your yard that you never realized before or water entering your home or crawl space. This would be the time to think about having French drains or dry creek beds installed in your yard. Also this is a good time to install rain barrels to catch the water from your downspouts for later use, water new trees and lawns. 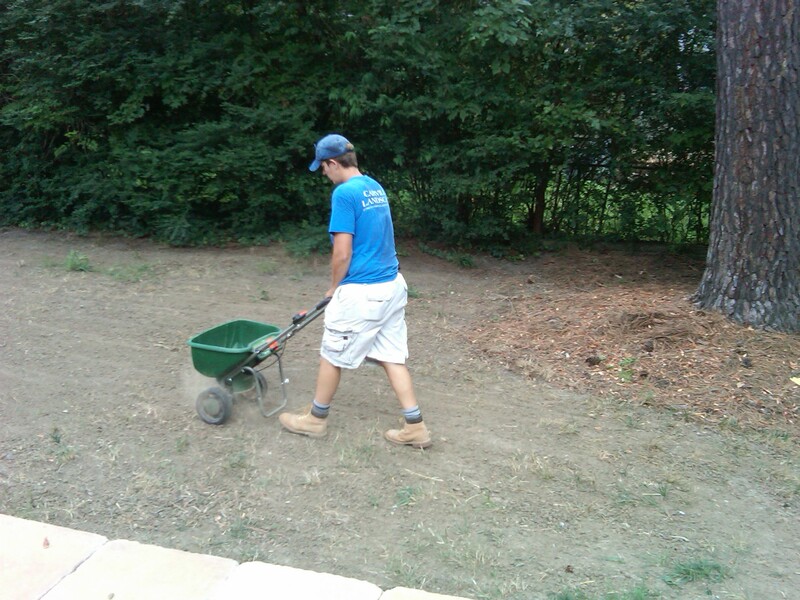 Lawn Renovation - As in our last blog, it is time for fall lawn renovation. Many landscapes have been damaged due to the hurricanes and it is time to start to put everything back together. 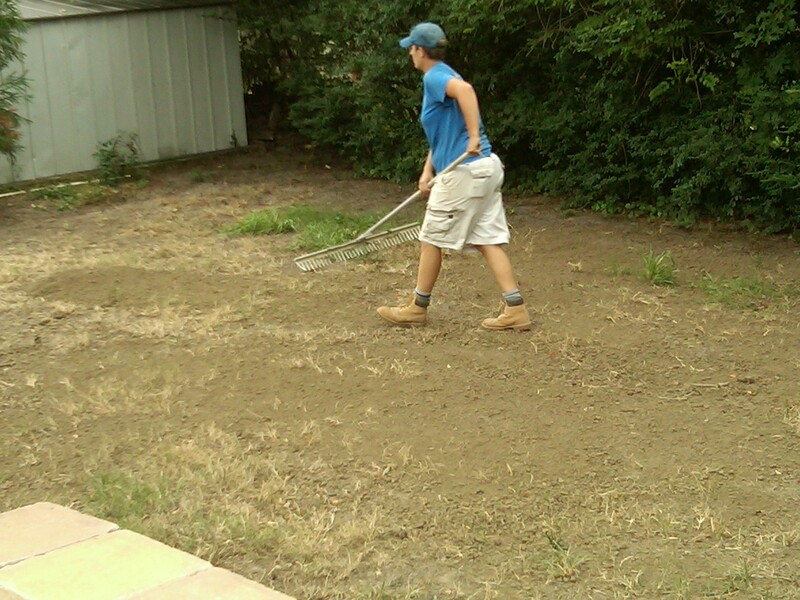 You may have new vacant places in your yard that could use some grass. If you were able to get grass planted last week, then you are in luck, all this rain has really helped. Take a look at our earlier blog with step-by-step directions on how to renovate your lawn. If you are thinking about a total landscape renovation or need some drainage help, give us a call, we are always available to help. After a very hot and dry summer here in Virginia, your lawn is probably going to need a little renovation this fall. As the weather grows cooler (and VT football is back), it is the perfect time to overseed your lawn. Below is a play-by-play of how to overseed your lawn yourself or if you need a little help, just give us a call at Carville Landscape Co.
Start by raking the entire yard and removing any debris and leaves (after Hurricane Irene there may be plenty of leaves). 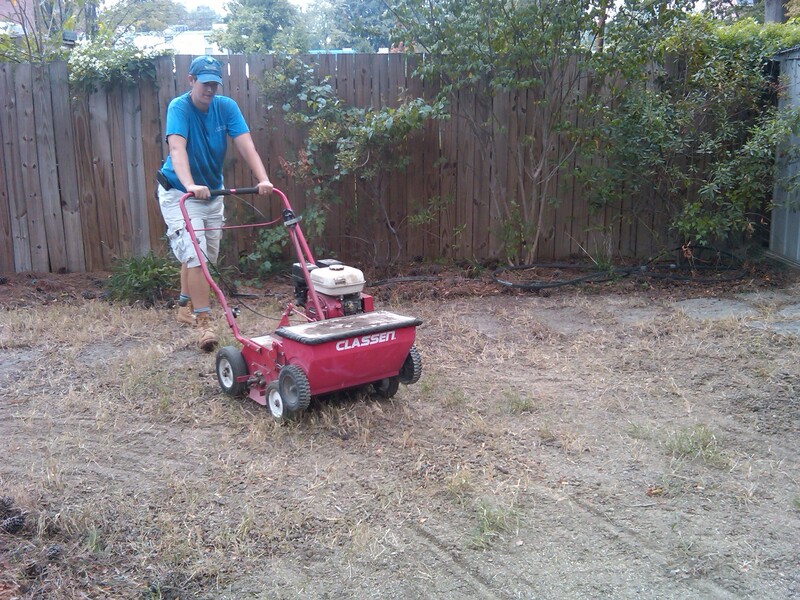 Then use a dethatcher to scarify and cultivate the existing lawn. If you want to kill any weeds or grass first, start by spraying a herbicide a week before overseeding. If needed, add some additional topsoil and rake it flat. Once you have prepared the soil it is time to add the seed. Do one pass with the seed then another pass with the fertilizer. Use a slow release fertilizer, which will release nitrogen into the soil for up to a month providing valuable nutrients for the seed to grow. 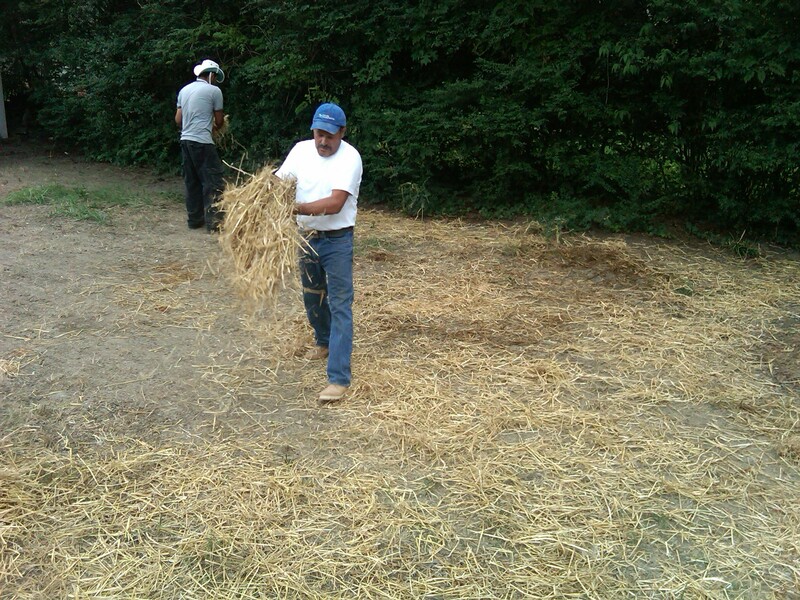 Then place a layer of straw over the entire area to help retain moisture in the soil. Then it is time to water, water and water. Keep the seed moist so that it will germinate. You should look at your own soil conditions, but watering once in the morning and once in the evening should keep it moist. For many of us the hot summer days mark the beginning of irrigation season. We seem to be in a bit of a dry, hot spell. So it is time to water! Most plants only need one inch of water a week, preferably in the early morning before the hot sun is out. Remember not to drown your plants this summer, just keep the soil moist. Too much water can be as bad as too little water. Also, always water plants first, then the grass areas. 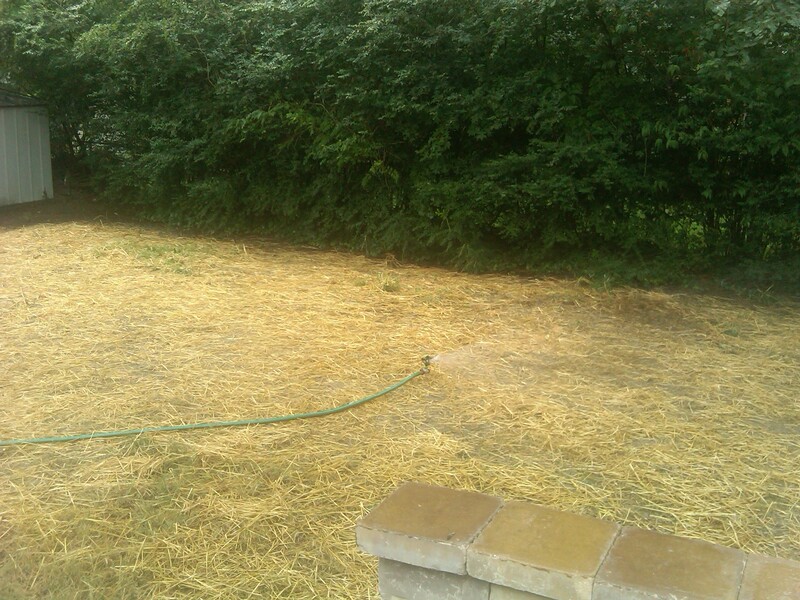 Grass is much easier and cheaper to replant if it dies. If you are looking for ways to be eco-friendly and conserve water this summer, check out our blog on rain barrels. Learn how to catch your rain water run-off and use it to water plants and even wash your car!